St. Vincent Indianapolis Hospital in Indianapolis, Indiana partnered with Cargill Deicing Technology to install a pavement surface overlay, similar to the one pictured above. INDIANAPOLIS, Indiana. – September 10, 2013 – St. Vincent Indianapolis Hospital has partnered with Cargill Deicing Technology to install a pavement surface overlay on one of its busiest driveways in an effort to reduce slips and falls from the slick conditions that can occur in the harsh winter months. The pavement selected is SafeLane® surface overlay, Cargill Deicing Technology’s patented, epoxy-aggregate pavement surface that provides anti-icing capability through naturally reactive deicer release. The aggregate in the overlay stores deicing and anti-icing chemicals, such as brine, and releases when needed, helping prevent slippery conditions such as frost, black ice and snow pack formations. Specially designed for common pedestrian areas such as walkways, stairs and parking ramps to provide fast-acting anti-icing and increased surface friction, SafeLane® surface overlay can help to reduce the number of slips and falls associated with snow and ice conditions. The impermeable epoxy layer seals the pavement and creates a durable bond with the aggregate, which helps prevent water, chlorides and chemicals from permeating and damaging the infrastructure. By pre-treating the surface with better-targeted applications the amount of chemicals used is greatly reduced, resulting in less run-off into surrounding vegetation and a more environmentally-friendly winter maintenance solution. 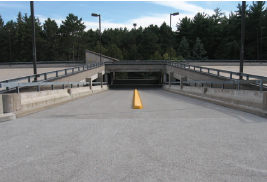 In addition to walkways, ramps and steps, SafeLane® surface overlay is also effective for dangerous intersections and curves or stretches of roads, entrance and exit ramps, and approaches to toll barriers and steep grades. The product is available for both vehicle (HDX) and pedestrian (CA-48) traffic. Driven by the faith of four Daughters of Charity who arrived in Indianapolis in 1881 with $34.77 in their pockets, the St. Vincent Hospital mission is to treat the poor and sick by following our Core Values of Service of the Poor, Reverence, Integrity, Wisdom, Creativity and Dedication. Our healthcare ministry has grown to include six Centers of Excellence: Women's, Children's, Orthopedics, Cardiovascular, Neuroscience and Cancer Care. The ageless mission of St. Vincent remains unchanged: to minister to the minds, bodies and spirits of those in need. For more information, visit www.stvincent.org.